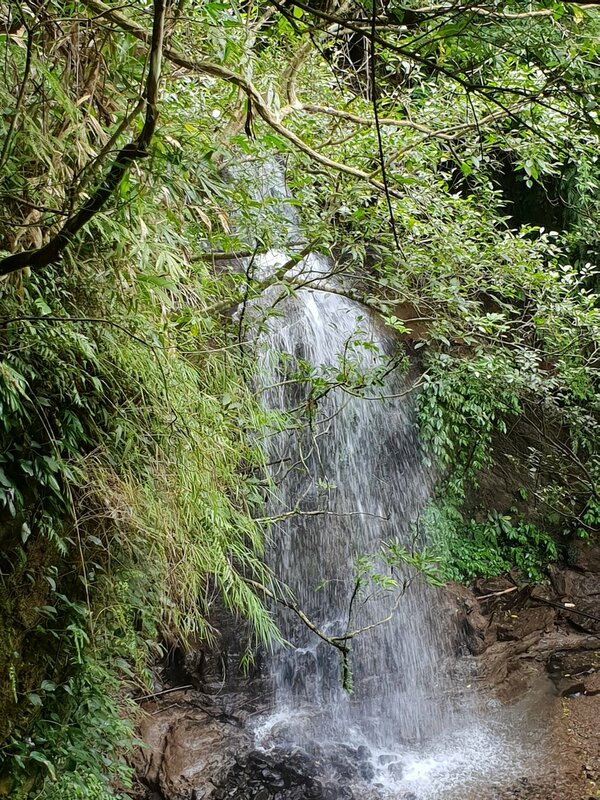 Most people know the Sandiaoling Waterfall Trail but it's not the only good trail in the area, or even the only waterfall trail. After seeing a picture of Youkeng Waterfall I pieced together some trails from Chinese language blogs and tried to wrap my head around some awful cartography. 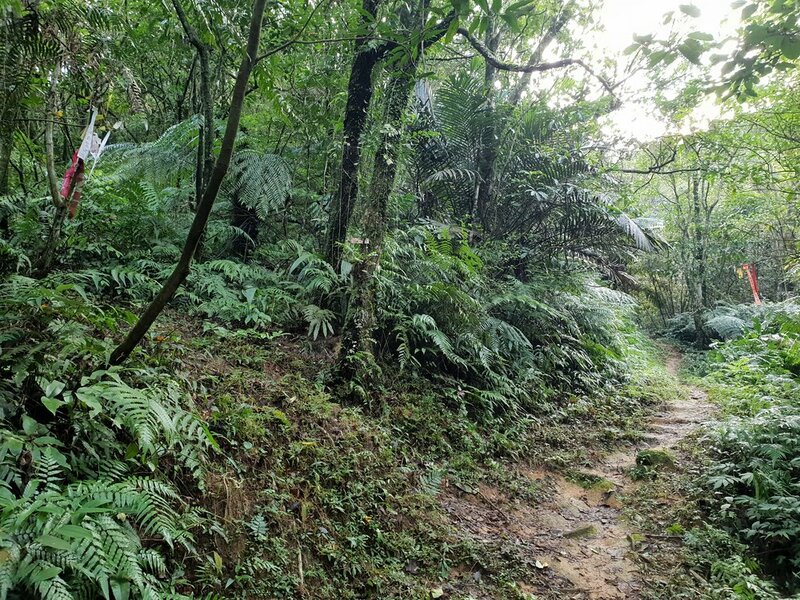 This digging lead to a fun and easy trail called the Youkeng Old Trail. It links the tiny hamlet of Dahua with Sandiaoling. Most people start from Sandiaoling, but it's a loop with a train journey so it doesn't matter where you start. I was driving and Dahua is a nearer to Taipei so I started from there. Like all the villages in the Pingxi Valley Dahua grew around coal mining. It's in an awkward location squished between steep cliffs and the Keelung River. The road down to it is extremely steep so make sure your brakes are good if you're driving. Lack of space and isolation meant Dahua didn't develop as much as other towns in the area. There are only a handful of houses. If it wasn't for hikers and tourists I doubt any trains would stop here. Bring a Pingxi Line train schedule with you to time the train as it's very infrequent. Also bring one because part of this hike involves walking on a stretch of track and there's no cellphone signal. It's not a “Stand By Me, Train” level of risk but the train is faster than I thought it would be. From Dahua station leave the platform, turn left and walk to a trailboard and some information about a coal bunker. What follows is a lot of steps but it's pretty much the only stretch of dull steps on the whole walk. You'll pass a coal hopper on the left before emerging onto a small road. Head left and after a couple of minutes there's a large concrete water tank on the right. Nearby is the wide track that leads to Dahua Mine. It starts as a wide track at least. Pretty soon the path is clinging to the stream bank but it's only a five minute journey. The mine is in a scenic spot right above the stream with a waterfall in the near distance. It opened in 1919 and was one of the larger mines in the valley. I can't work out when it closed but most mines in Taiwan closed in the 80's and 90's. The entrance is sealed, the roof has collapsed. A small mineral stained stream pours out from under the brickwork. Across the stream are a couple of very overgrown buildings, probably an electric room and offices. It's definitely one of the more beautiful old mines I've seen. Continue along the street and you'll reach a fork in the road. Take the right fork and the road will end in a small path. Head down this path and prepare to get hopelessly lost. Or don't, because I got lost for you. Cross the small bridge and head past the farms on your left side. Follow the tags to the top of a small ridge. I screwed up here. The poor contour detail and misleading path on the trail signboard meant I wasn't expecting a climb or a ridge here. Feeling I'd taken a wrong turn I backtracked, got lost in some farms, found a cool beetle, and then went back up to the ridge. Just continue forward on the most obvious looking path and it'll drop down to an idyllic farmhouse. A sign nearby says 'to waterfall'. This is where the train schedule comes in handy. The path will split. Take the smaller fork and you'll head under the train line and to the mouth of a small tunnel. I don't know what Taiwan's laws and punishments on trespassing on railways are so I may leave details a bit scant here. Judging by Chinese language hiking blogs it seems quite common to walk along the tracks. In any case, on the other side of two short tunnels are the Dahua potholes. Did I reach them through the tunnels or take these pictures on a another day? I'll leave that open-ended. The potholes themselves were formed by water swirling around and gauging out the soft rock. The plank bridge over the river is fun but I didn't find the potholes all that spectacular. There's an unusual shrine near the tracks. Here three high school children were playing in the water. One of them got into trouble and the other two tried to rescue them. Sadly all three drowned. 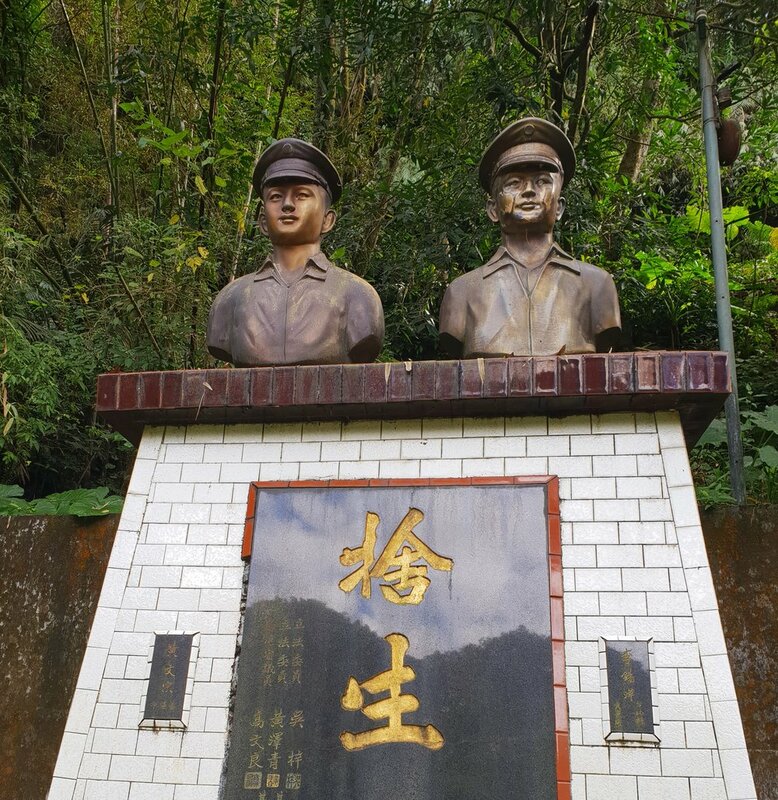 The monument commemorates the bravery of the two and acts as a warning about the dangers of the river. Taking the other split in the path to the waterfall (if you're coming from the Dahua potholes you could cross the curved railway bridge I suppose) will bring you alongside Cukeng Waterfall. This one is quite large but unfortunately difficult to get a good view of. Turn right at the tracks and follow them for about 10 minutes. I didn't see any warning signs about this stretch so I'm assuming it's fine. Youkeng Waterfall is one of the most photogenic I've seen in Taiwan. The levels and cascades are beautifully proportioned. I suspect there are a few nice pools on some of those levels but it looks impossible to climb up there. Leaving Youkeng I followed the tracks onward a little further. On the trail map it looked like the main trail joined here. It did not. Further down are two shortish tunnels. If you wanted to cut out a chunk of the hike you could walk through these and then join the trail over the hill and down to Sandiaoling. I don't recommend following the tracks right to Sandiaoling as the final tunnel is about 350 meters long and would be a really bad place to misjudge train times. I backtracked and rejoined the trail next to Cukeng Falls. Heading straight up you'll go through what appears to be old miner dormitories for a nearby mine called Shuoren. A friendly guy and his dog were camped out near one. I had a look for the mine itself but apart from some brick ruins I couldn't make out anything in the thick vegetation. Wolf Shepherd found the entrance and an electricity building but I missed these completely. I didn't know there was a mine here until I saw it marked on a map board. Turn left just past the dorm building and follow the trail over a small but steep hill. 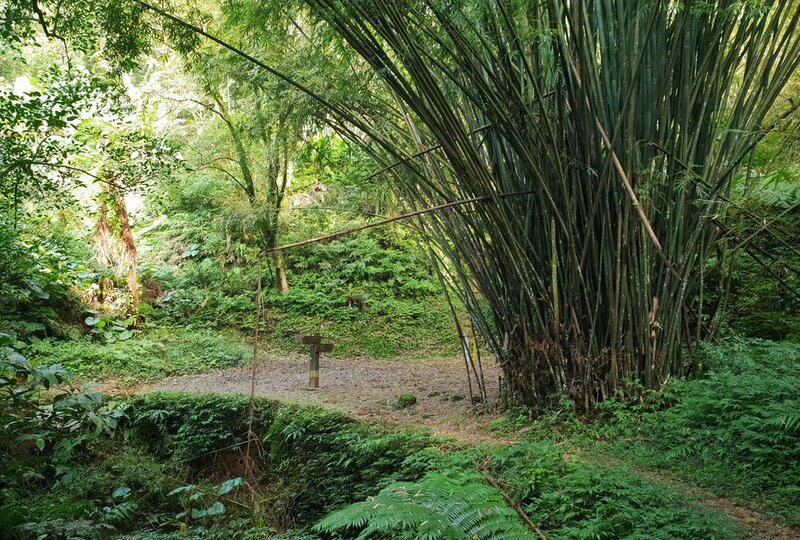 At the clearing with the big bamboo there's a choice: Take the right path over Mt Youkeng or the gentler left path. I took the path up to Youkeng. After the unimpressive summit it was a slippery struggle through damp forest and I regretted not taking the lower path. The two paths join again near a bridge. If you’re coming from Sandiaoling the left path heads up Mt Youkeng. The flat path goes to the bamboo clearing. I mistakenly thought a signpost indicated towards a path near a farmhouse. A large dog rushed out and bit me. It wasn't a hard bite, more a warning bite, but it was still unpleasant. If Taiwan really wants to get serious about attracting people to the outdoors it needs to do something about aggressive dogs, both feral and owned. I understand a need to protect property but this dog went way beyond its property. Hiking and cycling, even driving sometimes in rural Taiwan is not enjoyable when you have to constantly negotiate dog threats. I see reports of locals being mauled and I think it's only a matter of time before a tourist is (or I am lol). The short climb and descent to Sandiaoling is pretty but uneventful. 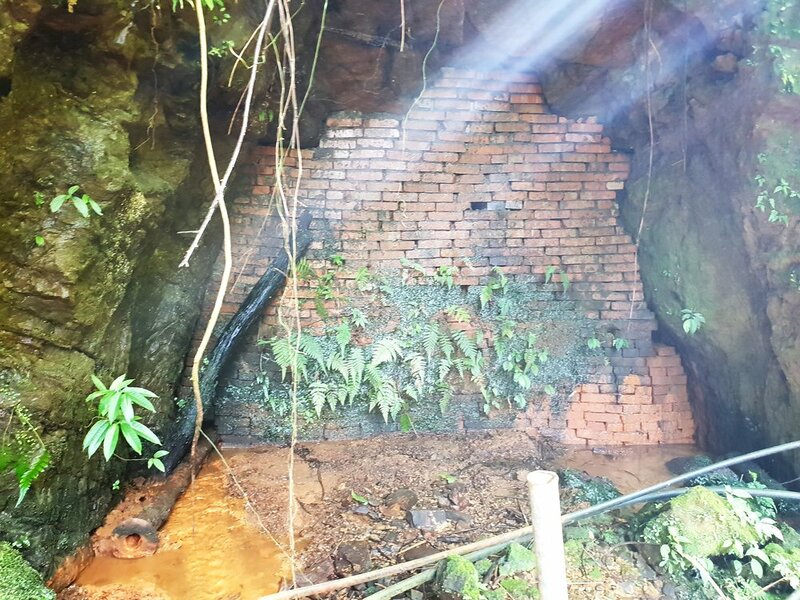 Whilst in the village I went to find the local mine. Despite many trips to the village I hadn't seen it yet. The tunnel was past another group of dogs. One was unfriendly but not brave enough to come close. The mine entrance has been landscaped with a really beautiful plant covering the foreground. Beyond the grate the tunnel is quite flooded and a small waterfall cascades within. This mine was open from 1948 until 1984 and so is more modern than I thought it was. Other places in and around the village include the famous waterfall hike, Menghuan Waterfall, and the old elementary school. From Sandiaoling either take the Pingxi train back up to Dahua if you drove or a mainline train. All sites can be found on the Hidden Taiwan Map.